Internet Shopping Works... Sort of! Internet Shopping Works… Sort of! I love the convenience of internet shopping and being able to come home from work to find that goodies have been delivered. As you can see, I’m planning a larger scale prototype. Just something simple to begin with; a solid frame, no suspension, six wheels, two motors. On Sunday (day before yesterday) it was my birthday, and I had asked the kind birthday pixies to bring me 6 wheels and two motors. One ebay seller sent the wrong motors (120w instead of 300w), and another only sent one piece of mild steel box section instead of the three that I’d paid for. In addition to this, mummy (Ada’s) bought me 12 wheels instead of 6! So whilst internet shopping is great, it’s not the same as walking into a shop and getting exactly what you need. 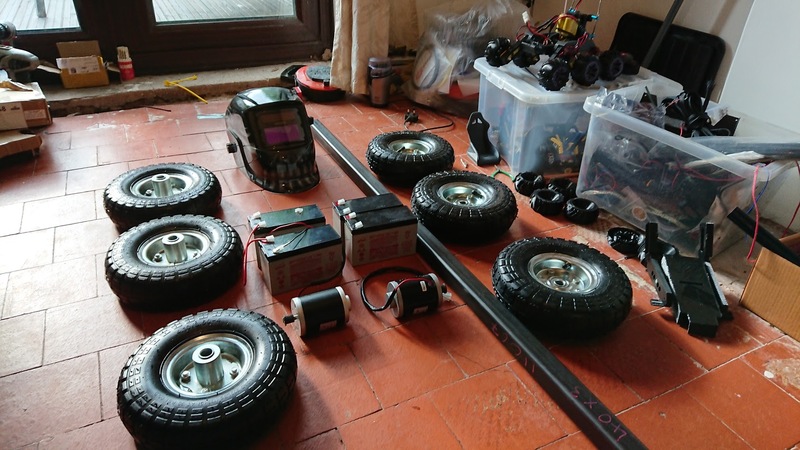 Nonetheless, as I sit here writing this, more goodies are on their way and I now have two spare wheels to play with and four more to make Ada’s brothers a go-cart. Woop! Permalink: Internet Shopping Works… Sort of!